Hope's Cafe: SGSG-Escapes Relaxing CD Review and Giveaway!! With the hectic holiday season almost here, most of us probably have mixed feelings. For me, there's nothing like being with family, enjoying each other and a good holiday meal. I also enjoy shopping for gifts (although I do take advantage of online shopping as much as possible). However, sometimes in the busy rush, we start to get stressed. I'm sure you all know exactly what I mean! So, while this gift I am sharing with you today would be perfect for anyone, it is an especially thoughtful gift for mothers! 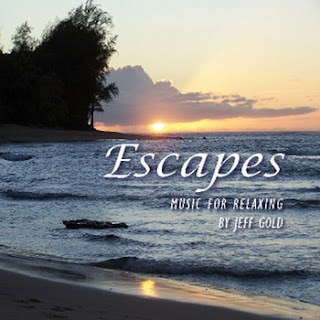 I received a CD by Jeff Gold called simply "Escapes". And it is exactly that! Almost an hour of beautiful, peaceful music. It is great for chasing away all the stress and tension that builds during the holiday season! I like listening to this in the evening after the children are in bed, and I can take some "me time" with a book and cup of coffee! The songs feature instruments such as piano, flutes (I love the sound of flutes), and various stringed instruments. While you listen to Escapes, you can almost see yourself walking the beach at sunset, or sitting on a mountain top somewhere viewing the majestic beauty around. I assure you any mother would be thrilled to find this in her stocking this Christmas! 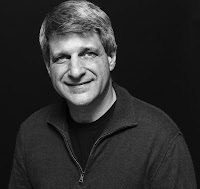 "California native Jeff Gold is a composer/musician who creates imagery through music; images that are emotional and melodic, restorative and uplifting. He composes soulful relaxing instrumentals which have received the attention of Wellness Centers, Spas and Music Therapists for their tranquil and healing qualities. Combining beautifully arranged acoustic guitars, piano, strings and flutes, Jeff has released two CD's "Soul of a Mountain" in 2006, and "Escapes" in 2009. Both area soothing and relaxing collection of melodies ideal for music therapy, yoga, massage, scenic drives or just winding down. Jeff composes and arranges all of his own music, playing the guitars and pianos, and creating other instrumental sounds by computer. He also does his own mixing, mastering and editing..."
You can listen to samples, purchase Escapes or find out more about Jeff Gold Music on his website! One of my readers will receive their own copy of Escapes by Jeff Gold! I would love to listen to escapes. I love relaxing music and when I'm feeling stressed I'd listen to it. I would love to give this as a gift to a friend, who is a massage therapist and is always looking for soothing relaxing music to use for her clients. I would like this for my son's room. We try to always play relaxation or Christian music while they sleep. Our last CD broke and I'm looking for a new one. My massage clients would definately benefit from this. I'd love to have some new music in the massage room! I would be the one that benefits from this. I think my son would benefit too. I would love to win it:) I like this type of music and the soothing sounds. Thanks!